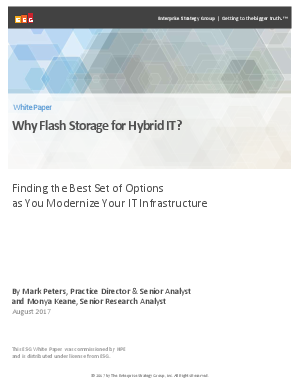 > Hewlett Packard Enterprise > Why Flash Storage for Hybrid IT? The term hybrid IT describes a delivery and consumption trend. Flash storage, on the other hand, describes a medium often delivered as a drive or as memory. Connections exist between them, though—important connections any IT organization hoping to optimize itself must understand. Hybrid IT is marked by a mix of on- and off-prem resources, often with multiple deployment types and consumption modes. It tends to accompany other newer approaches: i.e., convergence efforts, software-defined system implementations, or modernized application rollouts. By leveraging hybrid IT, an organization can deliver services in a more optimized, balanced, automated, granular, and flexible fashion.